Housing Out of Reach for Too Many – Direct Action Welfare Group Inc. The National Low Income Housing Coalition recently released their 2012 Out of Reach report. The report is a side by side comparison of wages and rents in every county, metropolitan area, and state in the United States. The report calculates the amount of money a household must earn in order to afford a rental unit at the area’s Fair Market Rent. Fair Market Rent is determined each year by HUD. In 2012 the average Fair Market Rent for a 2 bedroom unit in the US is $949. A person working minimum wage full-time earns $290 per week before taxes. At that rate a person would have to work nearly 3 and a half weeks just to pay the rent. According to HUD a person should pay no more than 30% of their income on rent. 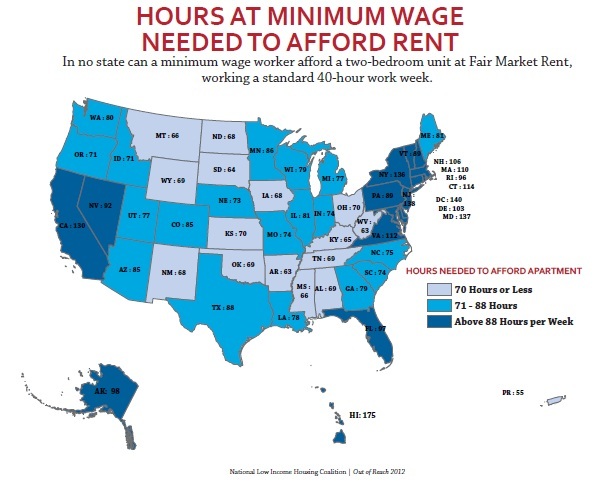 At the current minimum wage rate a person working full-time can only afford $377 per month in rent. Out of Reach cites West Virginia as one of the least expensive areas to live with Fair Market Rent of a 2 bedroom unit being $626 in the Charleston area, $599 in the Huntington area, and $660 in the Morgantown area. On average in West Virginia a person needs to earn $11.50 an hour in order to afford Fair Market Rent on a 2 bedroom unit. That is $4.25 more an hour then the current minimum wage. This report raises many concerns about hardships faced by hardworking families in our state. Too many families are one pay check away from foreclosure or eviction. Too many families are forced to live in over-crowded conditions or substandard housing because that is all they can afford. Too many families are working long hours and struggling with no end in sight. It is time we demand a living wage and affordable housing for all. Next: Next post: From Undocumented to Documented…..What Does this Mean Now? I completely agree and would like information on how to become involved in fight for more affordable, decent rental homes.